We’re excited to let you know that users can now buy and sell cryptocurrencies directly from the IQ Option website in the Wallet section! To help you spread the word about the new feature that will skyrocket your conversions, we have finished testing and optimisation of three landing pages — each one with distinctive attributes that give you an opportunity to experiment and see what converts best. This version answers the most common questions and provides impressive statistics to familiarise users with cryptocurrencies. It’s also available in all languages supported by the IQ Option platform. Clicking the “Buy” button allows users to purchase crypto without having to register on the platform — they just need to follow the animated or text-based instructions to complete the purchase. But here’s what really makes this landing page special: it features all cryptocurrencies at once, so it can be used in general campaigns about cryptocurrency, meaning there are more opportunities to use them. Best conversion results were shown by countries where traders prefer card payments, such as United Kingdom, Jordan, Ireland, Qatar, Sweden, Slovakia, Lebanon, Czech Republic, Kuwait, France, Denmark, Hungary, Estonia, Singapore, South Africa, Spain, Hong Kong, Norway, Lithuania, Finland, Switzerland, Chile, Luxembourg, Vietnam, Italy, Taiwan, Peru, New Zealand, Philippines, Thailand, Malaysia, India. Similar to Version 1, this landing page does not require users to register either and provides highest conversion in the same countries we mentioned above. 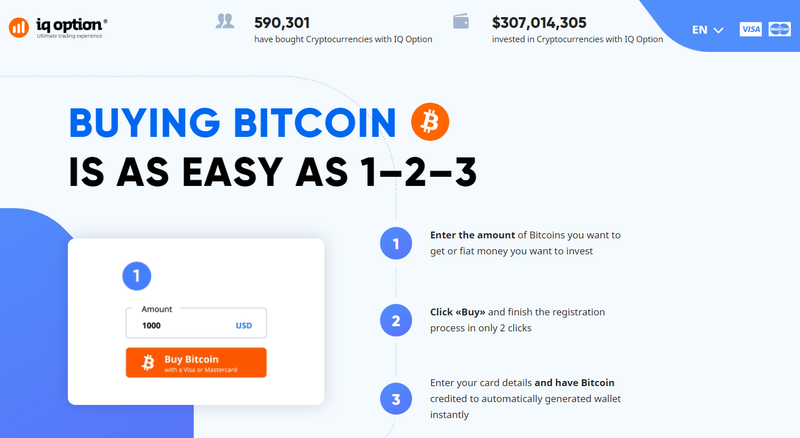 However, unlike the first landing page, this version lists instructions on the first page without the need to click the “Buy” button, which gives users an idea of what to expect once they decide to buy crypto. To change the currency, simply type “/currencyname” after the main URL. 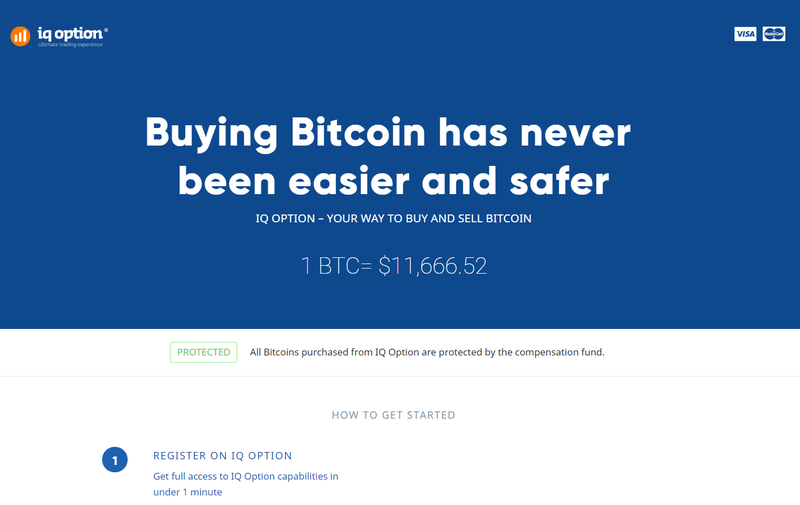 For example, if you want to choose Litecoin, type /ltc so the link looks like this: https://iqoption.com/lp/buy-crypto/en/ltc. If you leave the space after slash empty, the generated link https://iqoption.com/lp/buy-crypto/en/ will automatically direct users to the Bitcoin landing page. This one may remind you of our Buying Crypto landing page that uses the same minimalistic design and content, covering statistics, benefits of the wallet, dynamic price of specified currency and deposit/withdrawal methods. The main difference is the button — here it offers users to buy crypto without leaving the landing page, while the Buying Crypto one takes users to the traderoom. There is also an option to choose the cryptocurrency by typing its name after the main url. Even though all three landing pages show excellent conversion rates, we have found that higher LTV is shown by users that do register on the platform and actively use it by trading and making payments. If you’re on good terms with countries where traders prefer other payment methods to cards, our Buying Crypto landing page is a perfect fit for your traffic as it allows to make payments through different wallets, in addition to the card option, leading to a higher percentage of users converted into paying ones. Keep in mind that different promo materials can show different results based on your target audience, so you shouldn’t count on just one landing page. We advise you to test all types of promos to see what works best for your content and traffic, and in the meantime we’ll continue supplying you with the most effective marketing tools. Your personal manager is here to help! If you have any questions about the relevance of your content and promotional materials, please contact your manager or leave us a message via Support section. Buying crypto Crypto meltdown – a new opportunity? Commission for trading crypto assets reduced to 3.9%!